남편은 궁금했다. 모진 구박 속에서도 교회를 찾는 아내를 의심하기도 했다. 도대체 남녀가 한방에서 무엇을 하는지 예수쟁이에 대한 호기심이 생기기 시작했다. 무엇보다도 굳건한 믿음을 가지고 있는 아내가 믿는 예수님에 대해 알고 싶어졌다. 먼발치에서 아내를 지켜만 보던 남편이 전도부인의 안내로 예배당에 발을 디딘 그 날 밤, 하디 선교사의 설교에 감동되어 남편은 아내를 구박하던 자신을 회개하게 되었다. 이후 교회에 출석하는 일이 더 많아지게 된 남편과 온 가족은 1900년 1월 마침내 세례를 받게 되었다. 이름도 없던 그녀가, 최나오미라는 이름을 갖게 된 것이다. 최나오미는 1873년 경기도 개성에서 출생했다. 개성사람 김성률과 결혼했는데 아이가 없어 남편과 시댁 식구들로 부터 갖은 냉대를 받았고 남편의 술주정과 폭력, 시어머니의 구박을 감수해야만 했다. 기독교에 대한 호기심과 선교사들의 친절함에 이끌려 종종 예배당을 찾던 그녀는 차츰 선교사 가족들과 친분을 쌓게 되었는데 아이가 없던 그녀는 유독 선교사의 자녀들을 이뻐했다고 한다. 1899년 11월 여선교사 캐롤( A. Carroll)이 개성으로 들어와 자신의 집에서 예배를 드리게 되는데 최나오미는 그 예배에 꾸준히 참석하기 시작했다. 온 집안 식구들의 반대와 핍박이 있었지만 그럴수록 나오미는 더욱 열심히 교회를 찾았다. “ 최씨 부인이 교인이 되었는데 남편이 얼마나 학대하던지 남편과 헤어질 것도 생각했습니다. 그러나 그녀는 우리가 시키는 대로 남편을 위해 기도했습니다” 세례 이후 최나오미라는 이름을 갖게 된 그녀를 기억하는 선교사의 회고로도 알 수 있듯이 남편을 위해 기도하고 집안 살림에 힘쓰고 시부모님에게도 정성을 다한 그녀의 노력으로 온 가족이 세례를 받게 되는 놀라운 일이 그냥 이뤄진 일이 아님을 알 수 있다. 최나오미 부부는 1901년 4월, 원산으로 선교지를 옮긴 하디와 캐롤선교사의 초청으로 거주지를 옮기게 된다. 남편 김성률은 선교사 가정일을 보살피며 그녀의 든든한 후원자가 되었으며, 나오미는 캐롤선교사의 전도부인이 되었다. 선교 초기 원산의 유일한 전도부인이었던 나오미는 과거 남편과 가족의 박해를 받으면서도 굳건하게 지킨 믿음의 여정이 큰 자산이 되어 같은 처지에 있는 많은 여성에게 큰 위로가 되었다. 1903년 선교사 캐롤이 루씨여학교를 시작하자, 최나오미는 기숙사 학생관리를 맡게 된다. 믿음의 동역자 남편이 세상을 떠난 후, 주변의 가여운 아이들을 거둬 정성으로 키우며 새롭게 가정을 이루었다. 세브란스의 학교에 보낸 양자는 의사가 되었고, 룻이란 이름을 지어주고 열심히 키운 양녀 김노득은 후에 최용신과 함께 농촌계몽 운동을 펼쳤다. 전도부인 최나오미는 1907년 11월 개성에 여자성경학교가 설립되자 개성으로 돌아와 체계적으로 신학수업을 받은 후 교사로 활동했으며, 이어 서울 부인성서학원으로 자리를 옮겨 전도부인 양성에 힘쓴다. 이후 개성으로 돌아와 남성병원 전도부인으로 사역하기도했다. 그녀는 남감리교회의 선교 거점이 있는 개성, 원산, 서울 등지에서 지도력을 발휘하며 지속적이고 폭넓은 사역을 펼쳤다. 1920년 12월 6일 서울 종로교회에서 서울 ,개성,원산, 춘천 등 남감리교 선교지역의 여성대표들이 모여 조직한 ‘조선 남감리회 여선교대회’의 회장에 선출된 최 나오미는 회원들의 회비를 모아 국내외 선교사업을 체계적으로 추진해 나갔다. 당시 해외 선교는 남성 교인들 중심으로 일본,중국,러시아,하와이 등으로 파송되었는데 1921년 여선교 회원들이 특별기도 주일을 정하고 헌금하여 선교비 180원을 모아, 1922년 5월 제3차 조선 남감리회 여선교대회에서 시베리아 선교를 결의하기에 이른다. 이때 최나오미가 자원하여 그녀는 최초의 한국여성 해외선교사로 시베리아로 떠나기에 이른다. 흉년으로 기근에 시달리던 조선인이 두만강을 건너 연해주에 정착하게 되면서 조선인 연해주 이주는 시작되었다. 1925년에 연해주에 정착한 한인들의 수는 25만명에 달할 정도로 이주는 급속도로 늘었다. 감리교회는 1908년부터 만주와 시베리아에 있는 동포들을 위한 선교사업을 시작했는데, 여선교사 파송은 최나오미가 처음이었다. 그녀가 연해주의 블라디보스톡에 도착한 것은 1923년 10월이었다. 니콜스크에 여자성경학원 예비학교를 설립, 전도부인 양성에 힘썼는데 1년간 그녀가 설립한 여선교회는 8곳, 사경회 인도, 강연회 15회, 기도회 30회를 인도하는 활발한 활동을 하기에 이른다. 1917년 러시아 공산혁명 이후 시베리아에서의 종교활동이 금지되며 기독교에 대한 탄압이 시작되었고 기독교인들은 추방의 위협을 받게 되었다. 최나오미도 예외는 아니었다. 그러나 그럴수록 그녀는 얼어붙은 땅에서 경제적으로, 정치적으로, 종교적으로 고난을 받는 동포에 대한 사랑은 불타올랐다. “ 각 지방을 순행하는 때에 혹 여러가지 곤란함이 있었으나 이것이 나의 믿음을 시련하는 줄 아옵고 받았사오며, 낙심하였던 형제 중에 다시 회개하고 돌아오는 것을 볼 때에 주님의 권능을 찬송하였나이다” 최나오미는 동토의 땅 시베리아를 사랑과 헌신으로 품은 최초의 여선교사이다. Her husband was curious but deeply skeptical about his wife who was in search of church even in the midst of his disapproval. What could men and women do in one room? He was also curious about people who believed in Jesus. Above all, he wanted to know about Jesus who gave such strong faith to his wife. On the night when the husband, who had watched his wife at a distance, set foot in the chapel with guidance of Bible Women, he was touched by the preaching of the missionary Hardy. Consequently, the husband began to repent his hasty judgment towards his wife. By the grace of God, he and his whole family, who became involved with church to a greater extent, were finally baptized in January 1900. Fortunately, through baptism, the wife earned a name, Naomi Choi. Naomi Choi was born in 1873, in Kaesong, Gyeonggi-Do. She married a man from her own hometown. Since she could not bear children, she was treated very coldly and heartlessly by her husband’s family. She also had to endure her husband’s drinking problems and violent temper. Fortunately, her curiosity about Christianity and the kindness of missionaries led her to visit the church. When she gradually became acquainted with not only the missionaries but their families, Naomi, with no children of her own, poured out all her love on their children. In November 1899, when A. Carroll, a female missionary, settled in Naomi’s hometown and provided worship services in her residence, Naomi began to attend them steadily. The more her husband and his family opposed her visiting the residence and church, the more she was determined to attend. “Once Mrs. Choi became our church member, she thought about leaving her husband because of his abusive behavior. Instead, she started to pray for him as we advised her to do so.” As noted in the memoirs of the missionary who remembered Naomi well, her constant prayers for her husband and her devotion to the in-laws ultimately led the whole family to baptism. In April, 1904, with the invitation of missionaries Hardy and Carroll who moved their mission field to Wonsan, Mr. and Mrs. Choi also moved their residence. After settling in Wonsan, Naomi’s husband, Sung-ryul Kim, took care of the housework of the missionary family and became Naomi’s strong supporter. On the other hand, Naomi became the Bible Woman of missionary Carroll. Naomi, who was the only Bible Woman in the early days of missionary work, became a great comfort to many women who were in the similar situation. 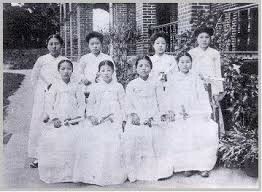 When the missionary Carroll started a school named after Lucy Armfield Cuninggim (Lucy’s women school) in 1903, Naomi Choi took charge of management of dormitory students. After her husband passed away, Naomi embraced the destitute children around her and started a new family of her own. The adopted boy who was later sent to Severance became a doctor and the adopted girl who was originally named Ruth, was later named as No-deuk Kim and joined Yong Shin Choi in starting a rural enlightenment movement. The Bible Woman, Naomi Choi, returned to Kaesong as soon as the Women’s Bible School was established in November, 1907, and formally studied theology . She then went to Seoul so that she could attend Women’s Bible Academy. Not long after, Naomi returned to Kaesong in order to assist as the Bible Woman in the men’s hospital. However, her devotion towards the task that she was entrusted with did not end at Kaesong. Naomi continued her wide range of ministry with her leadership in Kaesong, Wonsan, and Seoul where she had a mission base in the Methodist Church. On December 6, 1920, Naomi Choi was elected as the chairperson of the ‘Women’s Mission Conference of Chosun Methodist Association’ that was organized by female representatives of the South Methodist Mission Areas in Seoul, Kaesong, Wonsan, and Chuncheon. As the chairperson, Naomi Choi collected the pledges of members and systematically promoted domestic and overseas mission projects. Although, at the time, mainly male members were sent on overseas missions to Japan, China, Russia, Hawaii, etc. In 1921, women mission members of the 3rd Korean Methodist Church provided a prayer week and donated 180 won for the Siberian Conference. At that time, Choi Naomi volunteered to go to Siberia as the first Korean female overseas missionary. The people of Chosun began to cross the Tumen River and settle in the Maritime Province due to famine. Since then, the number of Koreans who settled there in 1925 reached to almost 250,000, and the number of migrants increased rapidly. Since 1908, the Methodist Church had begun missionary work for its compatriots in Manchuria and Siberia, and Naomi Choi became the first woman missionary to be sent. It was October 1923 when she arrived at Vladivostok in the Maritime Province. She founded the Women's Bible Academy in Nicolsk and worked hard to train the evangelism ministry. She had been active in leading 8 missions, urging for Bible studies, 15 lectures, and 30 prayer days in just one year. After the Russian Communist Revolution of 1917, religious activities in Siberia were banned, repression of Christianity began, and Christians were threatened with deportation. Naomi Choi was no exception. But the more her compatriots suffered economically, politically, and religiously in the frozen land, the more her love for her compatriots grew.